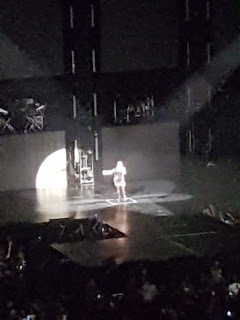 Finally after a 10 year wait I got to see Demi Lovato. It all started when Camp Rock came out on the Disney channel, I have lost count how many times I have actually watched that film. Demi's voice instantly became one I fell in love with and her acting was also amazing. If you ask my parents though they will say it all started back in Demi's days on Barney as I was obsessed with that show for far too long. I have all her albums and was absolutely gripped whilst watching her documentary on YouTube. 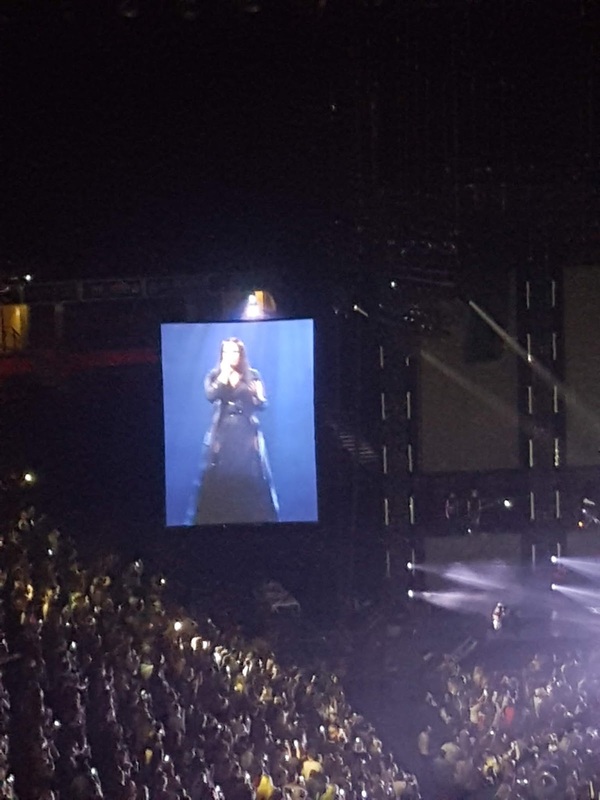 When tickets were announced we were in the process of buying a house, but after a bit of a debate I decided I was definitely not missing out on a chance to finally see her no matter how far back we were going to be sat and lets just say she did not disappoint. The first support act of the night was singer Joy, now this is someone who I hadn't heard of before but she was OK but not really my type of music. Next up was the amazing Jax Jones, I had not been a fan of Jax Jones until Demi collaborated on Instruction with him and WOW he was amazing on Saturday. Liam wasn't impressed but that is mainly because he really doesn't like that kind of music. Then finally it was time for Demi. 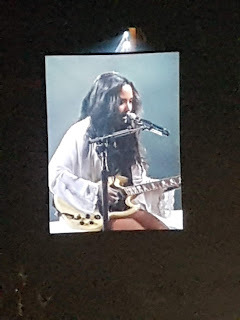 I really wasn't sure how Demi was going to be due to the fact she recently postponed 2 shows due to been ill however, I can not fault her, the voice is even more amazing live than it is on the album. Little videos were shown between some songs, like just before Daddy Issues when Demi was seen in a psychiatrist appointment then came on stage laid on the chair, or before Confident when a fighting videos was shown and she came out in the fighting robe and boots. 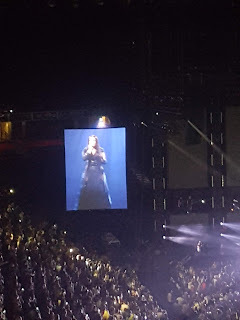 There was a mix of old and new songs and even songs she features on such as Solo and Instruction where Jax Jones came back on stage to perform with her. During Give Your Heart A Break there was even a kiss cam, it was great to hear this song live too as it has always been a favourite especially when she performed it with Fifth Harmony on the X Factor back in 2012. No matter what song Demi was singing she really gave it hr all, you honestly wouldn't tell she had an injured foot and had lost her voice a week ago. 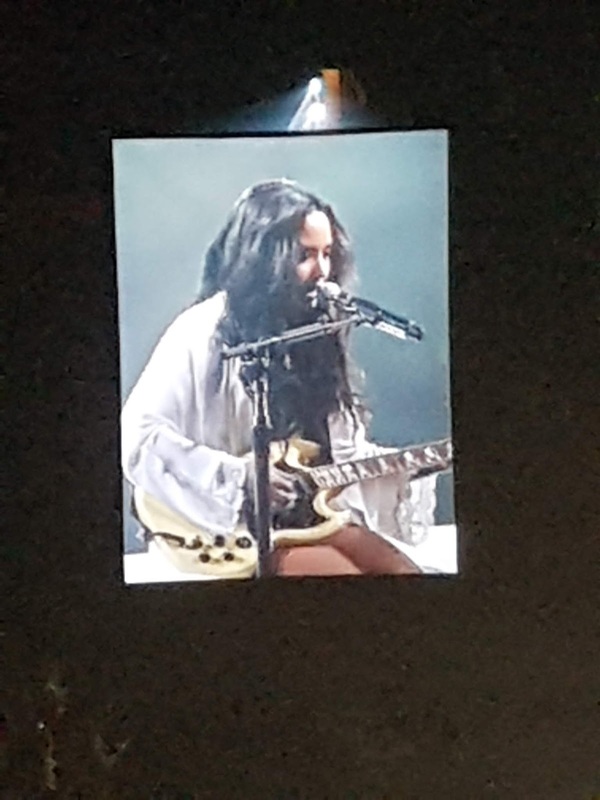 Demi even dedicated her song Skyscraper to the victims of the Manchester attacks and the strength of the City in the aftermath, which I thought was a very nice touch and due to a personal connection with that song already it was so great to hear it. Another great one was Warrior, Demi spoke about mental health before this song and it really hit home and meant a lot... I even recorded this song and the speech just so if I struggle ever again I can go back and listen to that. The whole show was absolutely perfect and just finally seeing her after so many years and what she means to me was absolutely amazing, I can't wait for her next tour. My favourite songs of the night were definitely Lonely, Daddy Issues, Warrior and Cool for the summer. 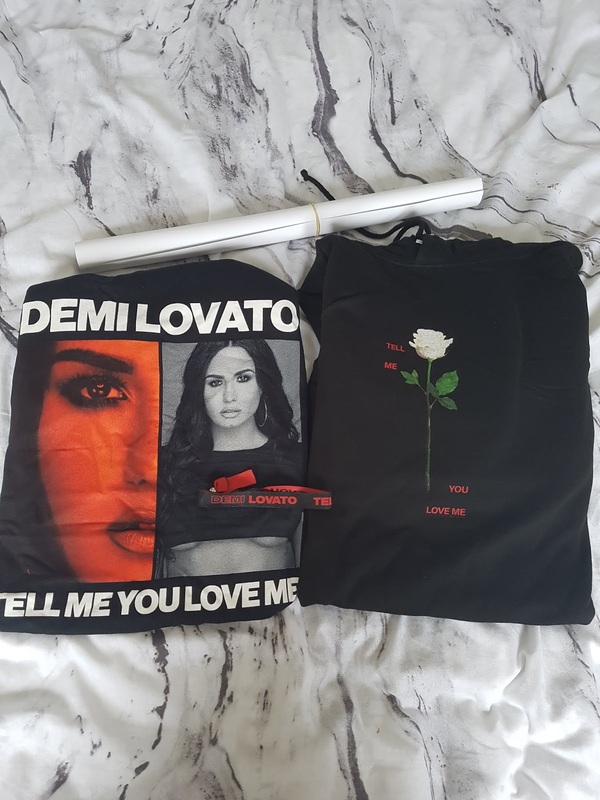 I picked up this tour t-shirt with the dates on the back as I always like to keep them, I usually wear it a few times then they go into a memory box before they get ruined however, this one may get worn a bit more as it fits perfect and is super soft. I also picked up a little festival band as I could really do with more bracelets and I liked how this is black and red. Next up is the most expensive item, the hoodie. I was hoping they had some with an image of Demi on but they didn't so I will have to look online for one of those. this hoody fits lovely and just has a simple rose along with the words tell me you love me along the side of it. 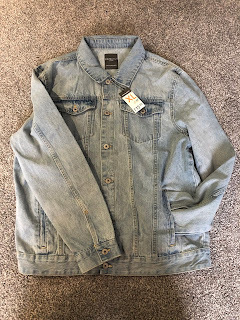 Finally I think this is my favourite purchase... The tour poster, we got this for in the games room as it seriously is lacking any images up on the wall and there was no way I was leaving without this. 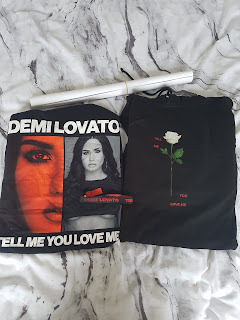 Next up for me is Navi King of Pop which I can't wait for but seriously Demi is one of my favourite shows of all time, that woman means so much to me and is the true definition of a Warrior. I am sure you will see a lot more of her on the blog in the future.